InstallShield Hangs: You have a process blocking the install. Use the Task manager and go to Details. Right-click on the setup program and choose Analyze Wait Chain. Then close down the apps blocking the process from starting. ScoreKeeper Screen Hangs: Right-click anywhere on the ScoreKeeper app screen and choose [Reset], then [Soft Reset]. If screen hangs again then check your roster for very long player names and letters in the uniform number fields or missing #. Error message pop ups. Right-click anywhere on the ScoreKeeper app screen and choose Debug, then uncheck all the boxes on the next screen. sklineup, skprint or sk2turb2 has stopped working message: If you have problems importing or exporting games try setting the file c:\winstats\pilot\sklineup to "run as administrator". Do the same for skprint and sk2turbo. Click Compatibility and then check Run as Administrator and choose APPLY. You may also need to turn off User Account Controls. Typical error message would be "sklineup has stopped working". Repeat this for sk2turb2 and skprint as well. Question: The stats for my players in the ScoreKeeper app do not include all the games played. Answer: ScoreKeeper looks for matching lineup names and then matching player numbers (not names) to total stats for. Go back into the other games on the palm and edit your line name to match. If you don't want to include some games in the stats then edit the lineup names to make them different. Note: If the lineup names are different, you can still import them into TurboStats. Just use the Select Team pull down on the Import Form to choose the other lineup name. Question: The Scoresheet prints strange characters and is off the page. Answer: If one of the teams used 5 or 6 or more pitchers in a game it changes the printout from landscape to portrait and may cut off the last couple of innings. Try setting your printer driver to 75% reduction to fit it on the page. Question: Is it possible to email the Scorebook pages from ScoreKeeper (Print Scorecard)? Answer: Yes, but not directly with our software alone. 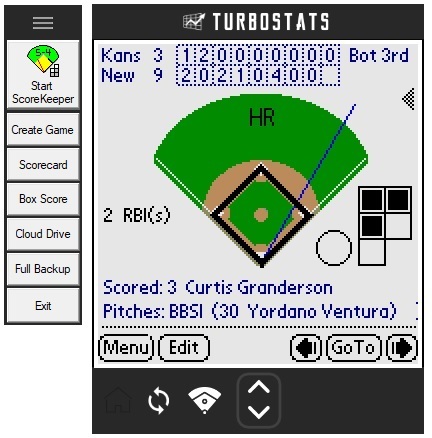 You need an PDF Creator program to give you a virtual print driver you can print to using Start>Programs>TurboStats>ScoreKeeper Print Scorecard. Download this free PDF printer from CNET Download Now or use Adobe Acrobat or DeskPDF from download.com Click here to visit the download site. Note: TurboStats is not responsible for performance or reliability of any shareware products. Question: How do I email a box score of a Scorekeeper game? Answer: Sync and open TurboStats Manager on the PC (or TurboScout). Open your team and click on the GAME button. Click on the IMPORT button to open the import the game screen. Select the game in the list of ScoreKeeper games, click text only [ Box Score] or [Web Box Score]. Next, click on the Post Website button. Then click preview. In Explorer use > File>Send>Page by-Email option. Question: My team was the home team, we won, and it went 7 innings (we didn't bat in the 7th, but we played the field). The players that played the whole game on my team show 6 (fielding tab) and I would have thought it should be 7 (subs seem to track the same when you add the two together = 6). The players on the other team (Visitors) only show 4 and I would have thought it should be 6 (didn't field in the 7th because We/Home team was winning). I printed the game summary and the score sheets and they all look fine? Can you tell me why this is? Answer: After you end the game you need to either press Menu > END GAME or make sure you advanced till you get the DUE UP box to appears. This credits the fielders with an inning played at that position. If you don't advanced to DUE UP the stats will be tracked but not the correct number of innings played. To fix this you can make the change in TurboStats after you import the game or go back on the Palm and open that game to advance to the DUE UP box. Then resync and reimport the game. Question: I used Edit and my Play by Play report does not print correctly. Answer: This is a limitation of using the edit feature. Certain edit operations actually destroy information needed by the Play by Play feature. Simple edit operations such as changing and error to a hit are safe, but significant edit operations such as changing an out to a hit will cause this problem. Also note that using Undo is safe and does not cause this problem. Therefore if you notice a mistake while scoring and have the opportunity to Undo the mistake right after it occurs, you are much better off doing that rather than going back later and editing the atbat later. Question: What is the proper way to score a 6-4-3 double play? Answer: When a batter hits into a double play, record the batter as a DP and fielding for the batter as 6-4-3. Then for the runner on first, record it as 6-4 force out. Yes, the outs may be out of order, but ScoreKeeper will insure that all stats are correct. Question: Winning Pitcher looks wrong after the data is imported into TurboStats. Answer: ScoreKeeper 6.0 works off the 5 inning rule for starters. 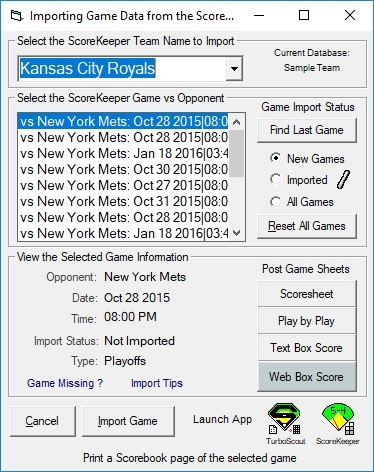 If you don't play 9 innings you can edit the W/L/S information easily in TurboStats after you import the game. ScoreKeeper 7.0 uses a % formula of overall innings to determine W/L/S. Again you can edit anything after you import the stats. Question: How do I advance a runner or runners without one E being counted 2 or 3 times? Answer: Enter the error once, then use the "Advance" button and select "Existing Error" from the pop-up list. This will allow you to advance runners on a previously recorded error. Question: I have deleted some games from my ScoreKeeper app and I now want to reload them back to ScoreKeeper to view the stats. How do I reload a game? Answer: Use Start > Search and choose Files or Folders. Search for *.pdb. You will find your game files. Double click to load the Palm Install Tool to reload them back to your ScoreKeeper app. Create or Open a team file in TurboStats. Use [Open an Existing Team] or Create a New Team. After you score a game in ScoreKeeper, sync your ScoreKeeper app to your computer. Start TurboStats on the PC. Register the software if you haven't already done so. See [Register] on the main menu. Enter team name and add players to your TurboStats team roster. Press [Game] to enter the TurboStats Game Form to import ScoreKeeper games. Press [Import], then [from the ScoreKeeper App] in the Game Form to bring up the Importing Game Data form. Select YOUR TEAM name from the "SELECT TEAM" box. Press BOX SCORE or IMPORT. New Game not in list. Did you play this team already? If you used the same game file name twice in ScoreKeeper, TurboStats thinks the new game is an updated game and it won't show up in the New Game list. Press [Reset All Games] to clear the old games and reset the game to import list. No Games in the game list OR ScoreKeeper is an "optional product" message. Click here to download ScoreKeeper 7.1. After ScoreKeeper installs sync and try to import the game again, OR reload ScoreKeeper (if you have a CD) and click on the ScoreKeeper Palm Pilot install icon (second to left, next to the glove). Use My Computer to view to the c:\winstats\pilot directory. Check for the file sk2turb2.exe. Right-click on this file and choose Properties > Compatibility and choose Run as Administrator (Windows 10, 8, 7 or Vista). Double-click on sk2turb2.exe. The curser should blink without any error messages. See if the games are in the list in TurboStats now. Click your Sync icon in the lower right corner of the Windows Desktop. Choose "Custom" from the menu. Make sure the system option says "Handheld overwrites Desktop" or Backup is turned on. Then sync again. Search for the ScoreKeeper game files on your PC. Use the [Start] button and choose SEARCH or FIND. Choose "All files and folders" and enter *.pdb in the "all or part of filename" box. Then press SEARCH. If you don't see any sk_? ?.pdb files or if you only see games from last year then the syncing is not working. Check the reinstall the Hotsync software. Reinstall Hotsync. Also see the Syncing instructions at the top of this page. Then move all the sk_.pdb files from the backup folder into a new directory or if all your games are still on the ScoreKeeper app then just delete all the sk_ files and send them to the recycle bin. Move one game file back at a time by using the RESTORE option in the recycle bin. Press the Field icon in TurboStats after moving in each game. When you move the problem game back, you will get the error message again. Note: games with innings longer than 17 will need to be shorted see below. It is possible for a user to create two games in ScoreKeeper with the same name. If one game file is UPPERCASE and the other LOWERCASE or if the case of any letter is different. We suggest you only capitalize the first letter of the game files to prevent this situation. You can score both games but you will have an error when you sync because the PC cannot interpret both games as separate files. The way to fix this is to rename the game with the app Fileman or you can delete or move the game on the PC in the c:\palm\yourusername\backup directory after you import the date into TurboStats. Then delete that game in the ScoreKeeper app. When you sync, the second game will come over and be listed under the <*> Imported Game option as the first game (date). You can import it from that menu. Note: you cannot rename the file on the PC and expect it to sync back to the ScoreKeeper app with a new name. It will still retain the original name use when you created it in ScoreKeeper regardless of the name you edit on the PC. 17 inning max limit. If you have a game longer than 17 innings sk2turbo.exe will not process any additional games and not create any error message. If you use RESET then you will no longer see any games in the list. To fix this you will need to record the stats manually for all innings past the 17th. Then in the ScoreKeeper app use the UNDO option to get back to the bottom of the 17th inning. Then sync again and the games should appear. Import the game then manually add the additional stats in TurboStats. Still no games? Email your game file (sk? ?.pdb) as an attachment to turbostats@hotmail.com. Importing a game brings up the other team's roster when we are the visiting team. In the ScoreKeeper app, select the game and go to the ScoreCard view. Press LINEUP and check the lineups for both teams. In the top right hand corner check the lineup names. Make sure there is not a blank space before the team name. If there is a space, delete it, sync again and use [Reset All Games] in the TurboStats Import screen. Still tries to bring in the opponent or you get an Error in Import Message. Check the Game Notes in the ScoreKeeper app. Click the game and tap details then note. Make sure there are no <enter> line space in the note. It must be continuous text. Use the Delete Note button, sync and try to import the game again. Make sure there are no ' " or / symbols in the player names, team names or game file names. Check the lineups for both teams, then sync and try to import again. Still imports incorrectly? Email your game file (sk? ?.pdb) as an attachment to turbostats@hotmail.com. Import Game Form does not appear. Question: When I choose games> Import from ScoreKeeper or press the Field icon in TurboStats, you get a message that says "can't find sk2turbo.exe". "ScoreKeeper is not installed" and the import form never appears. Solution: Exit out of TurboStats and delete the file c:\winstats\import.inf. Then start TurboStats again and it will reset the import.inf file. Old versions of ScoreKeeper potential error messages. Question: When I try to sync it gives me an error message like this one. -- Possible database overwrite problem. Backing up database with Creator ID 0x536b3031 to file C:\Palm\PasketE\Backup\sk_Granger_2.PDB. The file contained database with Creator ID 0x534b5453 data. OK System with 1 message(s). Solution: You created two game files with the same name but one is upper case. Delete the game that syncs over from the ScoreKeeper app after you imported it into TurboStats. Then find the game file on your PC and move it to another directory. Then sync and the second game will come over. Choose All Games when importing into TurboStats and select the previous game. This time the data will be for the second game. Make sure you use unique game file names in the future. Question: When I try to Import a game it brings in a few players and then give the error "Check the game notes". Solution: You created a player with only 3 characters in the name. This can cause this error. Add more characters to the players name in TurboStats on the PC in the Team Form. You can also add these extra characters in ScoreKeeper on the lineup and resync the games. How to delete a game in TurboStats you imported by mistake: If you imported an incorrect game then delete all players out of the batting order for the game in TurboStats and use Game> Delete Game menu to remove it. You can only delete the last game in the TurboStats game list. Exporting a Lineup from TurboStats to ScoreKeeper. Export to ScoreKeeper procedure to bring data into ScoreKeeper from TurboStats. Note: You can export a blank game with two lineups to score in ScoreKeeper. You cannot export any statistical data created in TurboStats as scorekeeper data. Only rosters. Press the Lineup tab at the lower left of the TurboStats Team Form. Drag players on the field and set the batting order if you wish. It can be changed in the ScoreKeeper app later. Press the Field icon in the Lineup Form. Enter the opposing team's roster if you wish. You can edit the lineup or add/delete players later at the field. You can create the opponents lineup from scratch at the field as well. When prompted select a User ID from the list. You can have more than one User ID syncing to your computer. Enter the game file name Be careful not to enter a game name you used before or currently have in ScoreKeeper. The game in ScoreKeeper will be overwritten when you sync if it has the same name. Press the Sync button when you are finished. The game should appear in your ScoreKeeper game list. Use My Computer to view to the c:\winstats\pilot directory. Check for the file sklineup.exe. Right-click on this file and choose Properties > Compatibility and choose Run as Administrator (Windows 7 or Vista). still no game in ScoreKeeper? Make sure you have selected the correct user id. Try it again and select another ID if there is more than one in the list. Reinstall the ScoreKeeper software. Try it again. If you still don't see the game, search for *.pdb and see if the game is being created on your PC. If so, use the Palm Quick Install Tool and press ADD to load the game manually. Problem: You create a new lineup in TurboStats, then press Sync and your game does not appear in the ScoreKeeper game list. Solution A: Start your Palm Install Tool using Start> Programs>Palm Desktop>Palm Install Tool. Check to see what the default user name is. If you have more than one user that's your problem. Delete the other users in the Palm Desktop under Tools> Users. 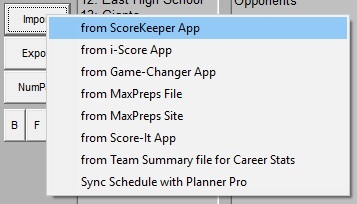 Solution B: If you only have one user on in ScoreKeeper and still do not see the new game in the game list you probably are creating a ScoreKeeper game with the same file name as an existing game in the list. When you use the TurboStats Lineup Creator to make your game and hit the export button, a default file name will be created using the opponents name. If you played this opponent already then you will create a duplicate game if you accept the default that will replace the game in ScoreKeeper. Just make a change to the game data file name to solve the problem. Note: you could lose game data if you did not import the game and you make a new game with the same file name. Question: How Do I Start a New Season? There are various approaches to creating a new season in ScoreKeeper and TurboStats. We have listed a few methods here so choose the best method for your program and your desired use of last year's data. Just so you understand how ScoreKeeper games are backed up. When you sync the ScoreKeeper app, it copies all of your ScoreKeeper game files to a folder on your computer. Usually c:\program files\palm\your palm id\backup. These files end with .pdb. If you use the Delete function in ScoreKeeper the game files will be moved on the PC when you sync to a folder called "archive". You could always add these old games back using the Palm Quick Installer app. Approach 1. No need to use or refer to last year's data in the ScoreKeeper app, but you want to save the career totals in TurboStats on the PC. On the PC start TurboStats and use Create a New Team. Enter a new filename like Reds2010 so you can refer back to the year in the future. Add players to the team or use the IMPORT button if any players have come back from last year's team. Under the IMPORT screen, select Browse and open last year's TurboStats team database. (example: Reds2009). Double click on all players from last year that are returning and press SAVE after each. Then press IMPORT again. Repeat this until all the old players are imported from last year's database. If you press CAREER you should see their old stats. NOTE: If you don't want to see their old career numbers, use the ADD button and retype in their names instead of using IMPORT. In the ScoreKeeper app, sync to save all the old games back to your computer. Open ScoreKeeper in the ScoreKeeper app. Highlight each game in the Game list and press DELETE until they are all gone. Sync your ScoreKeeper app again. This will move all ScoreKeeper games to the archive folder on your PC. Open TurboStats then open your new team file and press LINEUP at the bottom. Sync the new game over to the ScoreKeeper app. After scoring your first game open TurboStats, then open your new team and Press [Game] to enter the Game Form. Approach 2. You want to refer to last year's data for your opponents stats and spray charts on the ScoreKeeper app and you want to save the career totals for your players in TurboStats on the PC. You don't want last year's stats for your team to be included when you view stats in the ScoreKeeper app. It's important to understand that ScoreKeeper tracks stats by Lineup Team Name and Uniform Number. Open ScoreKeeper in the ScoreKeeper app. Any old games you don't want to keep, delete them now off ScoreKeeper. Then Sync. In the ScoreKeeper app, ScoreKeeper tracks stats by the Lineup Names and Uniform Numbers. If any of your opposing players have new uniform numbers for this season, you must go back to the old games on ScoreKeeper, click Lineup and edit the numbers. Be careful as editing uniform numbers must be done in steps (one player at a time) so ScoreKeeper won't get the data confused. For example. If someone has the number 2 this season but was number 10 last year and is now number 2 this season, then follow these steps. If there was another player #2 last year in the old ScoreKeeper games, change the player from number 2 to a number not used in the lineup like number 20. Then exit the ScoreKeeper lineup and ScoreKeeper will search through all old events changing number 2 to 20. Now go back into the ScoreKeeper Lineup and edit the player coming back with a new number from number 10 to 2 and exit the lineup. Repeat this until all the old players have been edited to their new numbers for this season. If there is a new player on the opposing team that didn't play last year that is using another player's number from last season, you don't want to see the old player's data when you press ALL GAMES in ScoreKeeper. Edit the old game lineups to change the uniform numbers from players not returning to numbers that are not used on this year's team. Change them one player at a time, exiting the lineup after each change. Repeat for each game against this opponent in the ScoreKeeper app. If you exported a new game to score (this season) from TurboStats, open that game in ScoreKeeper (or tap NEW to create a new game in ScoreKeeper. Use the pull down list to open the opposing team roster but type in your team lineup name and make it different from last season. Example Reds2010). For all new games this season, your team lineup name will be different than last season (example: Reds2010) but your opponents lineup name will be the same as last seasons. When you press All Games you won't see any old stats for your team but you will for the opponent. If you don't want to make changes to the opponents lineup, you can give them a new lineup name as well for this season. If you want to see their spray charts and stats you have to exit the game you are scoring, open an old game from last year and view the stats. Since the lineup names are different, it won't mix-up the players with new uniform numbers. Approach 3. Clear the old games and start with a clean slate. Delete all the games off your ScoreKeeper game list. Then press RESET in the Games> Import from ScoreKeeper screen to start the new season. You can also run the program in your c:\winstats\pilot directory called skBackup.exe click here if you don't have it. Run this program to move your sk_?? game files from your c:\palm\your_user_id\backup directory into an archive directory. c:\palm\your_user_id\archive. It is important to do this each year so you don't accidentally use the same game file name as last season if you play the same opponent again this season. Question: How do I edit the pitching stats if I forgot to change pitchers? Answer: The Edit button allows changing a previously recorded atbat including changing the pitcher. There are times when you need to change an atbat recorded earlier but do not want to use Undo, losing all the data that was recorded after the atbat that needs changing. The Edit button will allow you to edit every aspect of the atbat. Care must be used when using Edit . It is possible to edit an atbat to create situations that make no sense, such as 4 outs. To change an atbat use the left <- arrow to scroll back the each atbat you need to change, tap EDIT to bring up the edit form. If you are changing pitchers, select the pitcher for the atbat, then press PITCHES to bring up the pitching form and then press Done. Pressing Pitches is necessary to transfer all the pitches thrown to the new pitcher. Otherwise the new pitcher will get the Batter Faced and the stats but not the number of balls and strikes thrown. REPEAT this for each atbat you had the wrong pitcher in. NOTE: although you can change all the pitching stats, the number of innings pitched in the Fielding Stats sections of TurboStats will not import correctly and will show the original innings. 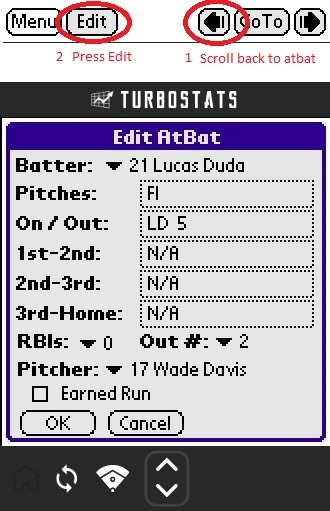 After you import the game into TurboStats, select the new pitcher in the batting order, press the fielding tab and choose the Pitcher position from the pull down list, edit the number of innings and then subtract the number of innings from the original pitcher. This will not affect the Pitching stats, only the fielding innings played if you don't make this change. Question: The Pitching summary doesn't fit on the page. Answer: Depending on how many players are batting, the summary might not fit on the page. There is no fix for this except for using legal size paper and changing the paper size in the printer setup.